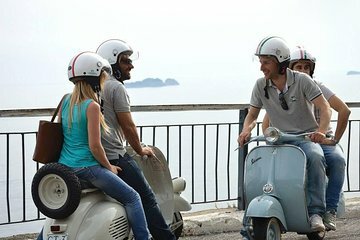 Taste the best of Naples with this private food tour, riding on a vintage Vespa scooter through the city. Visit different neighborhoods to sample local specialties, including a sfogliatella pastry and coffee at the famous Grand Cafe Gambrinus. Learn from an expert pizza chef how to make your own authentic Neapolitan pizza. Bypass traffic during the tour by getting around on a Vespa scooter, steered by an experienced driver. What a way to learn the streets of Naples, see the sites and taste great food. We started off our food tasting at a wine shop where we had wine, cheese and prosciutto, next we had street food treats, and made pizza. We learned about the history of Naples, the neighborhoods. The Vespa was a fun way to get around the city!